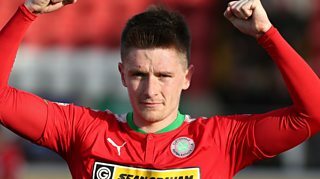 Ryan Curran's injury-time goal helps Cliftonville to a 2-1 win over Glentoran at Solitude, potentially ending Gary Smyth's reign as Glens boss in defeat. Paul O'Neill's powerful header put the east Belfast side in front after six minutes, with Rory Donnelly responding with 20 minutes to go. Curran fired home after Joe Gormley's knock down in the dying minutes, sparking wild celebrations from the home support.